A compact crossover with a growing audience. 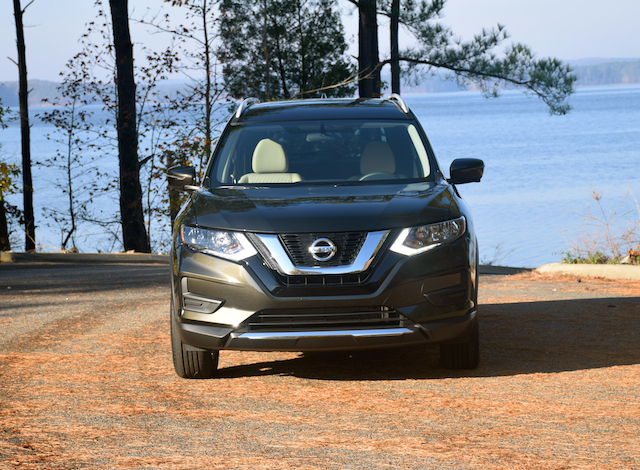 The Nissan Rogue was a latecomer to the compact SUV segment, but has certainly made up for lost time. Introduced in 2008 and overhauled in 2014, the Nissan Rogue is now one of the top sellers in the segment, trailing only the Honda CR-V and Toyota RAV4, and currently outselling the Ford Escape and all other comers. 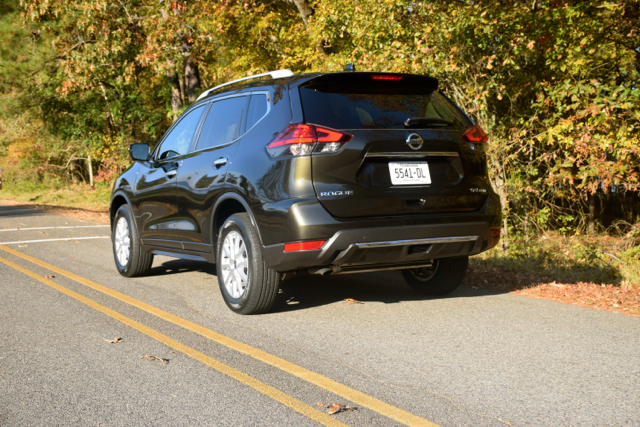 A 2017 Nissan Rogue SV AWD was a recent weekly driver, the middle of three trims available. Nissan prices the 2017 Rogue S from $23,820, the SV comes in at $25,240, and the top-of-the-range SL will cost you $29,960. Add $1,350 for all-wheel drive. Changes for this year include an updated front end and a motion-activated liftgate. Additional driver assistance technologies include intelligent cruise control and forward emergency braking with passenger detection. A first-ever Rogue hybrid also debuts and is marketed separately. The Rogue’s look is a familiar one, meshing well with Nissan’s current design language, but with one notable exception: you won’t find the deep profile cuts as seen on the Maxima or the floating roof evident on the Murano. A pronounced grille, firm shoulders, a rising beltline, and distinctive rear combination lights are among the most notable features you’ll find with this model. Standard 17-inch steel wheels with covers become 17-, 18- or 19-inch aluminum-alloy wheels elsewhere. All-season-tires are standard; run flats are available. All models come with a temporary spare tire found underneath the cargo area floor. Halogen headlights are standard as are LED daytime running lights and LED tail lights. Automatic headlights and front fog lights are available. 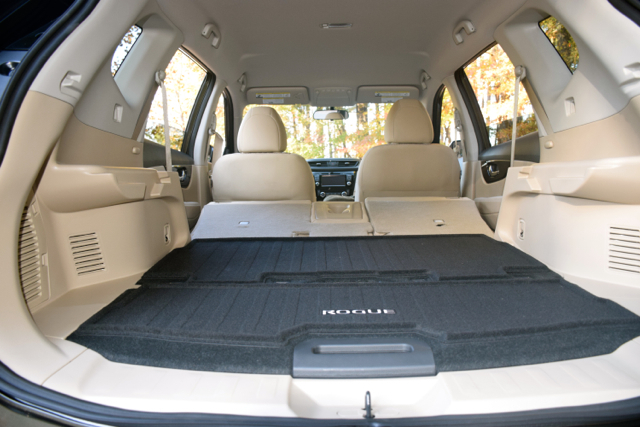 The Nissan Rogue is one model that offers room for as many as seven people. All models supply standard space for five, while the S and SV provide a seven-passenger seating option. Those two extra seats are essentially jump seats — that means you’ll use them in a pinch as when you need to stick a pair of pre-teens back there. Otherwise, enjoy the 32 cubic feet of storage space with the jump seats out of the way (70 cubic feet behind the first row). You’ll find bucket seats up front and either a 40-20-40 or a 60-40 bench seat in the second row, the first choice providing a pass-through to the rear storage compartment. In models equipped with a third row, a 50-50 bench seat is present. 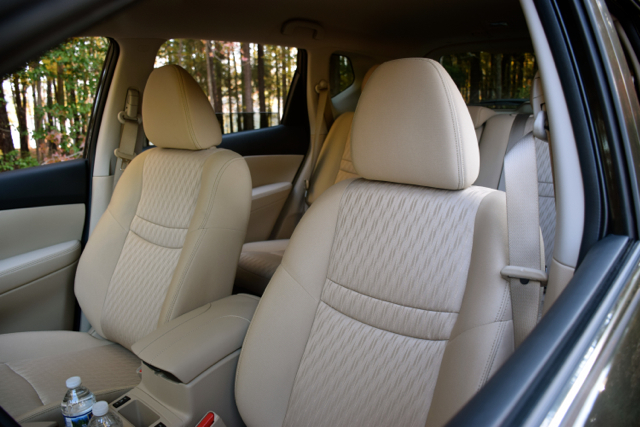 Premium cloth seats are standard; leather seats are available. You’ll find ample room in the front and more than sufficient room in the second row. Three adults sitting side by side in the second row make for tight space, but it can be done. Better yet, drop the armrest in place and use it to access the drink container holders. The 2017 Rogue offers keyless entry with push-button start, a front seat center console, four cup holders, up to six bottle holders, and air conditioning. You’ll also find full power accessories, map lights, mood lighting, cruise control, and an overhead console. A power panoramic moonroof is available as part of a package upgrade. The standard four-speaker audio system is certainly not enough for audiophiles, while a six-speaker audio package is standard on the SV and a Bose nine-speaker audio system is available. Opt for the Bose system and you’ll enjoy the rich sound it provides. All models provide Bluetooth music streaming, three 12-volt outlets, USB connectivity, satellite radio, MP3 capability, and NissanConnect with mobile apps. A navigation system is standard with the SL and available with the SV edition. Our test model was equipped with navigation and it delivered accurate turn-by-turn directions each time it was put in use. Yes, even in rural areas it correctly mapped a way back to populated centers. The 2016 Nissan Rogue was an Insurance Institute for Highway Safety (IIHS) Top Safety Pick recipient. Testing for the 2017 model has yet to be conducted, but we anticipate at least a similar score. 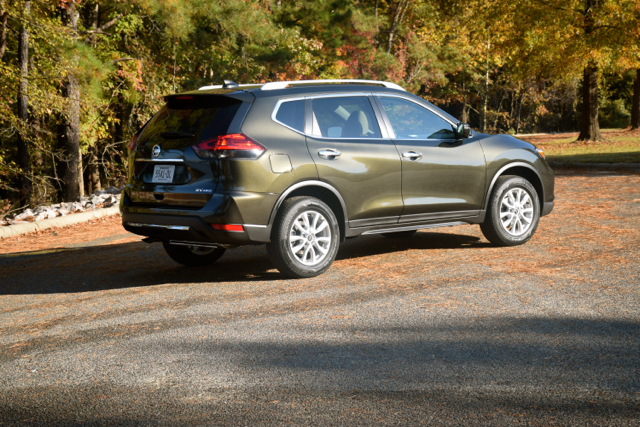 In safety testing overseen by the National Highway Traffic Safety Administration (NHTSA), the 2017 Rogue received four out of a possible five stars. Beyond the expected safety features (i.e., airbags, stability and traction control, and an energy absorbing steering column) available features include forward emergency braking with pedestrian detection, blind spot warning, lane departure warning, lane departure prevention, and rear cross traffic alert. Intelligent (adaptive) cruise control is also available, what helps maintain a safe distance between you and the vehicle immediately in front. Where some competitors offer two or three engine choices, the 2017 Rogue comes in with just one powertrain combination: a 2.5-liter four-cylinder engine paired with a continuously variable automatic transmission. This engine makes 170 horsepower and 175 pound-feet of torque. Importantly, in a segment where achieving 30 mpg is a stretch for some models, the Rogue makes an EPA-rated 26 mpg in the city and 33 mpg on the highway. Very few small crossover utility vehicles offer a performance side; the Ford Escape is an example of one such model that does. That said, Nissan aims for the heart of the lineup by offering an SUV with sufficient power and superior fuel economy — a winning formula for many buyers. The chief concern for some buyers could very well be with the transmission. Nissan has been building CVTs for more than 20 years and has mastered the technology. Are CVTs problem free? No, which is one reason why you won’t find them in most high-performance engines. They’re ideally suited for four cylinders and are found in some V6s. Stomp on the accelerator and the Rogue moves cleanly and steadily down the road. Under such conditions, there is a lot of noise emanating from underneath the hood and you’ll also experience the unmistakable feeling of the transmission pulling as it continues up through what feels like one long, endless gear. Most drivers, however, won’t push the Rogue so hard and will discover the fuel efficiency benefits of driving with anything but a lead foot. What kind of a driver are you? So, which Nissan Rogue should you buy? Personally, rarely do I ever refer buyers to the base trim. Indeed, most of the convenience features mentioned herein are found on the middle trim. If you want access to the top technology and safety features, then only the SL will do. Springing for an all-wheel-drive version makes sense if you live in a snowy climate. It can also come in handy on wet roads as torque is spread across four wheels, not just two. As for the seven-seater option, if you need the extra carrying space, then the midsize Pathfinder SUV or the Quest minivan are your best options here. Among Nissan crossovers, you’ll only find a manual gearbox with the Juke, a subcompact model slotted beneath the Rogue. Check out the Murano if you need more interior room and prefer V6 power. Choose the SV trim with all-wheel drive and opt for the $1,380 premium package (navigation, around view monitor, motion-activated liftgate, satellite radio, a heated steering wheel, and Sir Eyes Free) and your cost will come in around $29,000, including the $940 destination fee. Similar competing models often top $30,000, so you already have a strong price point in advance of employing your negotiation skills. In all, the 2017 Rogue provides everything for what the vast majority of small SUV shoppers want. Moreover, if you’re new to the segment or to the Nissan brand, putting it on your short list makes perfect sense.